Changing jobs can be rough on families with young children - especially in homes with low income and few educational resources. According to new research by American University School of Public Affairs Associate Professor Taryn Morrissey, income and employment instability can be harmful to a child's health and food security. The article, "Economic Instability, Food Insecurity and Child Health in the Wake of the Great Recession," which Morrissey coauthored with Sharon Wolf of the University of Pennsylvania, appears in the September issue of Social Service Review. The researchers looked at families with children ages three to five using data from the 2008 Survey of Income and Program Participation. "We focus on young children because during this developmentally important period, economic resources, family stability, and other characteristics are particularly important to life-long cognitive, health, and social-emotional outcomes," said Morrissey. "Also, this is a time when families often struggle financially to meet their basic needs - including for food, housing, and child care - which are very expensive." 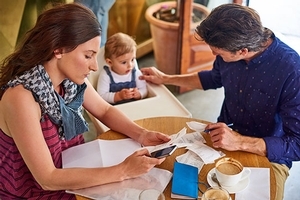 The analysis revealed that each year more than half (60 percent) of children under age five experience a change in a parent's employment status, and about half experience a change in income equivalent to or greater than 33 percent of their household income. Income instability levels, in particular, are even higher among children with less-educated parents. Approximately six or seven of every 10 children whose parents lack a high school degree experience an economic change in any given year. The authors also found that losing a job is linked with an increase in the likelihood of food insecurity, and that income change - regardless of direction - appears to be associated with an increase in food insecurity. "I was struck by how common the experience of income and job instability is among families with young children," said Morrissey. "Further, this economic instability appears to be harmful for food security and health." Safety net and labor policies designed to provide resources to families during times of need may have unintended consequences for economic instability. Morrissey suggested that safety-net programs such as the Supplementary Nutritional Assistance Program (SNAP) - formerly known as food stamps - and the Earned Income Tax Credit may aggravate economic instability by providing sudden decreases in resources when families miss the deadline to re-enroll in a program. Procedures that make it difficult to enroll (or re-enroll) in public programs may make resource levels less predictable for families, enhancing economic instability rather than stabilizing resource levels. According to Morrissey, two potential solutions exist: (a) make workers' job schedule and hours more predictable and stable over time; and (b) improve the procedures of public programs that facilitate enrollment and re-enrollment among eligible populations to enhance, rather than disrupt, economic instability. For instance, lengthening and streamlining enrollment and re-certification periods and procedures for programs such as SNAP, Medicaid, and child care subsidies could help families better predict their expenses.